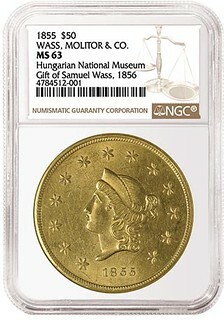 I read that the Hungarian National Museum had some California gold coins graded and slabbed. I asked my friend Balazs Csanady about going to see them. He found out that they are not on public view right now but can be seen on the museum web site. Go to mnm.hu, click on English, then search, and put in "California gold coins". An interesting story, these coins came from Hungarian nobleman Count Samuel Wass who in 1855 gifted the museum with samples of the coins he had struck. An 1852 $5, 1852 $10, 1855 $20 (which unfortunately is now missing), and 1855 $50. The museum contacted the American Numismatic Association who connected them with the Numismatic Guaranty Corp. Arrangements were made to have the coins graded in Munich. 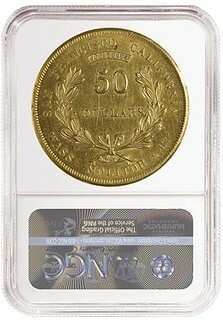 All the coins were graded Unc, but the round $50 piece, which NGC described a "Stunning", was graded MS63. The museum was quite satisfied, and said they hope the cooperation with NGC can be continued in the future. Numismatic Guaranty Corporation® (NGC®) has certified three rare gold coins struck by Wass, Molitor & Co. in the 1850s during the height of the California Gold Rush. The coins were submitted to NGC's office in Munich, Germany, by the Hungarian National Museum, which received the coins from Count Samuel Wass. A prominent Hungarian, Wass came to the United States in 1849 during Hungary's struggle for independence. (The unsuccessful Hungarian Revolution is so important to the people of Hungary that its start, March 15, is celebrated as a national holiday today.) In 1851, Wass moved to California and partnered with another Hungarian, Count Albert Molitor, to start a gold assay firm in San Francisco: Wass, Molitor & Co. The firm was among several private assayers that struck coins in California in the 1850s to satisfy the state's desperate need for circulating coinage. Wass, Molitor & Co. issued $5 and $10 gold pieces in 1852 and $10, $20 and $50 gold pieces in 1855. The designs of the coins mirrored official US gold coins but some of the legends were changed. For example, "LIBERTY" was replaced with "W.M. & Co." on the $5, $10 and $20. The $50 gold pieces, which were larger than any circulating US gold coins, featured a wreath on the reverse with the legends "WASS MOLITOR & CO. SAN FRANCISCO CALIFORNIA" around the perimeter.